How often do you think about your breathing? If you’re thinking to yourself, “Well I’ve only done it my entire life, I know how to breathe”, my question to you is, are you sure? I’m not saying there’s a “right” way to breath, but the breathing exercise I will teach you allows you to get a deeper, fuller breath. First, put your hand on your stomach and push in just a little bit. 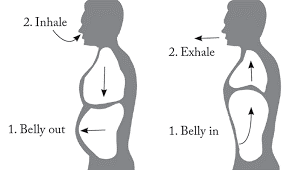 This is where you should expand as you inhale. Take a deep breath in through your nose and let the air fill your lungs, pushing your hand up. Your entire body, from your point of pressure to your chest, should expand if you are doing the exercise properly. Then exhale through your mouth for twice as long as you inhaled. You should exhale all the air from your lungs, and your hand should lower as you exhale. Once you feel you have cleared the air, repeat. If you find yourself struggling to expand at the stomach properly, try it laying or sitting down. Well, I hope you choose to start this or another breathing exercise into your daily routine. Remember, our minds and body’s need oxygen to survive, so be sure you’re getting enough of it. Even a couple good, deep breaths can help you get the oxygen you need. 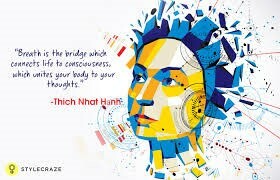 How it’s done: A yogi’s best friend, this breath brings calm, balance, and unite the right and left sides of the brain. Starting in a comfortable meditative pose, hold the right thumb over the right nostril and inhale deeply through the left nostril. At the peak of inhalation, close off the left nostril with the ring finger, then exhale through the right nostril. Continue the pattern, inhaling through the right nostril, closing it off with the right thumb, and exhaling through the left nostril. When it works best: Crunch time, or when it’s time to focus or energize. Just don’t try this one before bed: Nadi Shodhana “clears the channels” and make people feel more awake. “It’s almost like a cup of coffee,” Pacheco says. “Your lung capacity is the total amount of air that your lungs can hold. Over time, our lung capacity and lung function typically decrease slowly as we age after our mid-20s. Some conditions like chronic obstructive pulmonary disease (COPD) can significantly speed up these reductions in lung capacity and functioning. This leads to difficulty in breathing and shortness of breath.” Fortunately, there are exercises that can help support and increase lung capacity, making it easier to keep your lungs healthy and get your body the oxygen. And last you can use breathing exercises to help you fall asleep. I hope this information has helped you to Breathe, Breathe, Breathe.